Power(s) given Make cloud platforms and step over them. Cloud Mario is a powered-up variation of Mario that appears in Super Mario Galaxy 2. It is the most common power-up in the game. The Fluffy Bluff Galaxy and Cloudy Court Galaxy make prominent use of Cloud Mario. After grabbing a Cloud Flower, Mario can create a cloud by shaking the Wii Remote and use it as a platform for a short time, after which it disappears. However, Mario can only do this three times; otherwise, he can grab another Cloud Flower to refill the number of clouds he has. 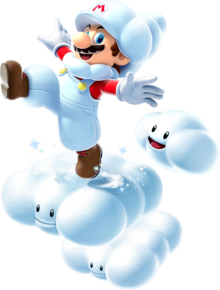 Every time Mario creates a cloud, one of the clouds behind him disappears, letting the player know how many clouds he has left. Like Bee Mario, when Cloud Mario touches water, he loses the power-up and returns to normal. Mario can also jump farther and fall more slowly when the power-up is active. Additionally, in this form, he can step on some clouds that would disappear had he stepped on them in his normal state. Cloud Mario also appears in the Puzzle Plank Galaxy, and this power-up is used to defeat the boss Bugaboom. In Throwback Galaxy, Cloud Mario is needed to collect five Silver Stars. In the Starshine Beach Galaxy, Cloud Mario is needed to climb to the top of the Cloudy Tower on the main planet. In Bowser Jr.'s Boom Bunker, Cloud Mario is needed to climb high enough to Ground Pound the cockpit of Bowser Jr.'s Boomsday Machine and defeat Bowser Jr. Cloud Mario's final appearance is in the Grandmaster Galaxy, and it is needed to navigate an electric maze. A Cloud Mario costume and racket for Miis appears as an unlockable element in Mario Tennis Open. In order to get the costume, the player must give 10 characters a star rank. The racket for this costume costs 1800 coins for Miis to use. In Mario Golf: World Tour, a Cloud Mario costume, Cloud Mario golf ball, and Cloud Mario golf club set can be unlocked. The golf ball and clubs appear in the shop after playing rounds, and the costume becomes available when the player succeeds 20 times in Endless Approach Practice. Wii Super Mario Galaxy 2 (05/2010) Guess what happens when Mario collects a Cloud Flower! Oh, wait. You can already see exactly what happens... That's right, Mario dons a fluffy hat, overalls, and a scarf and gets a whole lot lighter. He can jump farther, stay in the air longer, walk on clouds, and even make cloud platforms. This outfit is all silver lining! Enemies such as Goombas can walk on Mario's clouds, which he cannot achieve in normal form. Coins can also stand on one of his clouds. This page was last edited on May 26, 2018, at 20:38.